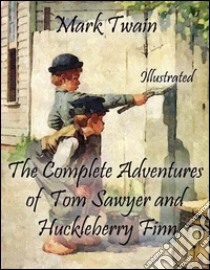 The Complete Adventures of Tom Sawyer and Huckleberry Finn: Illustrated by Mark Twain. With over 300 illustrations. Adventures of Tom Sawyer, searching for treasure, witnessing a murder, getting caught in a bat cave, tricking others into doing his work, running away with Huckleberry Finn--Tom Sawyer's antics and mischief-making are sheer, child-pleasing delight. Adventures of Huck Finn, son of the town vagrant drunkard. Sleeping on doorsteps when the weather is fair, in empty hogsheads during storms, and living off of what he receives from others, lives the life of a destitute vagabond. Tom Sawyer Abroad in a parody of Jules Verne adventure stories. Tom, Huck, and Jim set sail to Africa in a futuristic hot air balloon, where they survive encounters with lions, robbers, and fleas to see some of the world's greatest wonders, including the Pyramids and the Sphinx. Tom Sawyer Detective, he attempts to solve a mysterious murder in this burlesque of the immensely popular detective novels of the time.